Super Cheese Marijuana is one of the most famous commercial Indica strains of all times. Supercheese has the best features of the original Cheese such as the unmistakable cheese flavor, extreme power and medicinal properties. Supercheese is one of the most famous commercial indica strains of all times being a great Marijuana easy to grow with an umistakable taste and aroma. Supercheese from Positronics was created by crossing two Skunks keeping the best features of the original Cheese such as the unmistakable taste and aroma of stale cheese and incorporating new genes adapted to current needs. 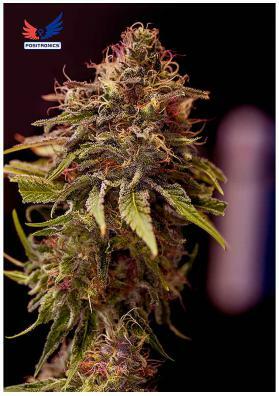 This genetic grows bushy, low and thick and behaves like an Indica: low-medium height, fir apperance and large. It is easy to grow and is the perfect option for those who wants high yields in a discreet manner. Its flowers are quickly covered with a thick layer of white resin. But above all, what really stands out in this strain is its marked and telltale smell during the flowering period. In this way, we recommend to use carbon filters and ventilation systems indoors to avoid to be invaded by the smell of skunk, besides that, it thrives very well in a growing room tolerating some begginer errors and in 66-69 days it will offer spectacular productions ranging from 300-400 grams per square meter. In the garden, you should give it some type of support from the beginning to avoid the flowers to bend or break the branches. It will develop fully with a southern exposure and a good quantity of sunlight hours. In that case, this strain will offer half kilo per plant to be harvested in mid-October. Once harvested the plants smell released by Super Cheese will remind us the Dutch 80's coffeeshops. The flavor will be strong as the smell, sweet and sour, like some aged cheese, hence its name. The effect will be relaxing and sensitive; Super Cheese will be advised in the framwork of a therapeutic use of Marijuana. It will be advised to consume it when we don't have anything to do because it may be slightly incapacitating.